﻿ Real Reef Rock 4.0 - Closest Yet To The Real Thing? Real Reef’s Gen 4 Reef Rock, first teased online May 21st, 2014. Here is a quick glimpse inside Gen 4 Real Reef. 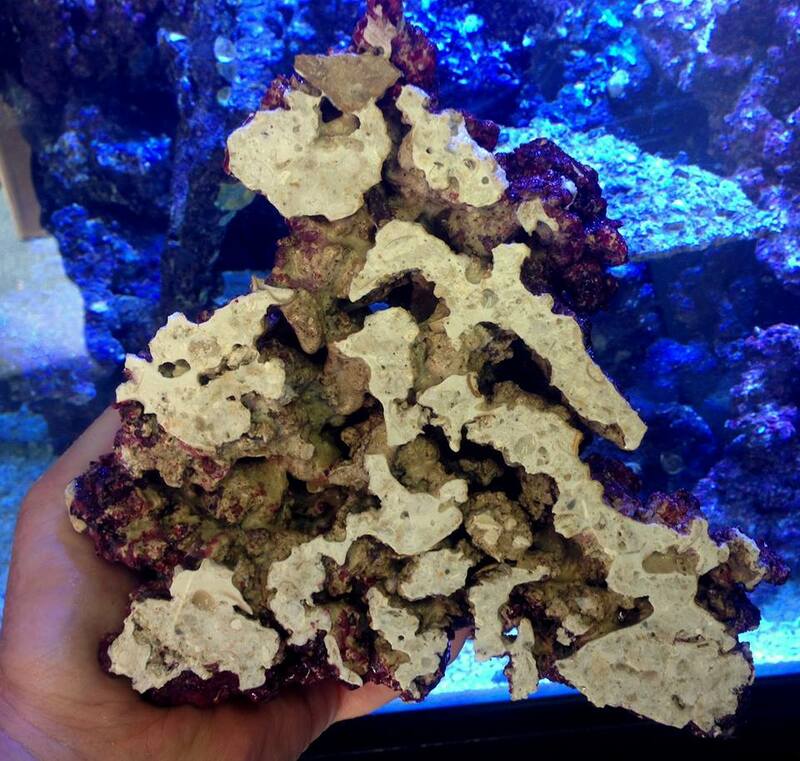 20% lighter and better looking than real coral live rock! It will be available from grow out this July. This piece was cut in half, for those to see the clean porous makeup of our rock. Real Reef’s objective is to mimic Mother Nature, with better natural reef safe materials and function for your Aquarium. 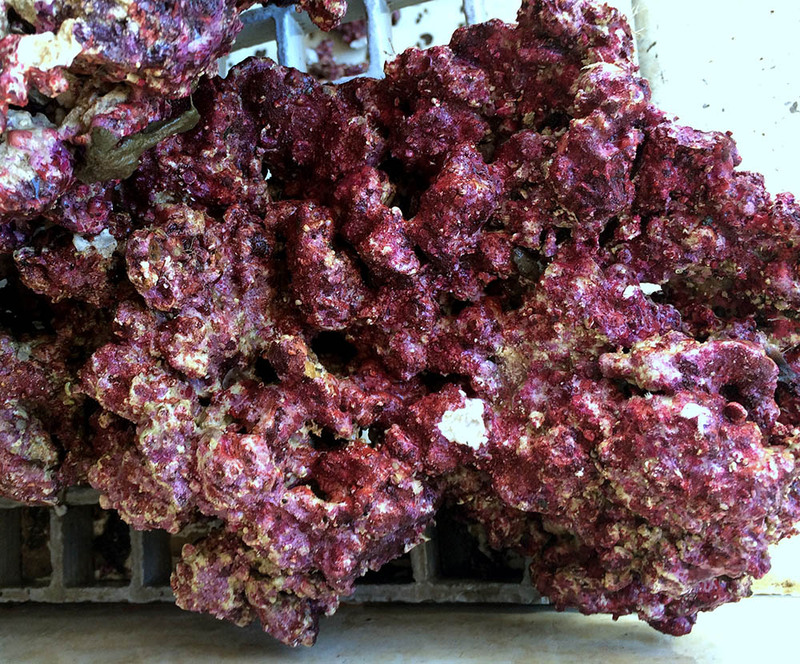 We offer double the available Calcium Carbonate and our available trace elements exceed that of wild live coral rock. 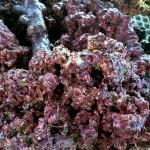 We don’t use epoxy, acrylic or any paint in production of Real Reef. Nothing fake, artificial or misleading. I thought it might be interesting to show a comparison of some of the first generation rock to show just how far they have come. This was a photo I took of a broken-open rock 3.5 years ago, back when Real Reef was still a product being put out by aquarium livestock wholesaler Fish Heads, who’ve since headed 100% into their Reef Rock business. Since then their product has come a long way. One of the questions I’ve seen asked about this product most frequently circles around the purple surface coloration. 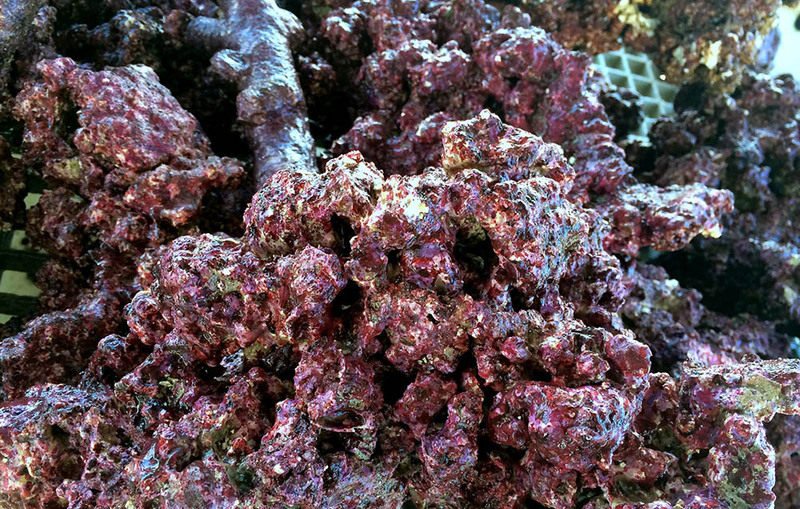 Real Reef actually took the time to respond to consumer questions on that May 21st photo tease, and provided some additional, interesting information about the coloring of the rock. It is not a paint. It’s a water-based stain we use in the process of making it. Non-tox and does not seal the rock like paint would. 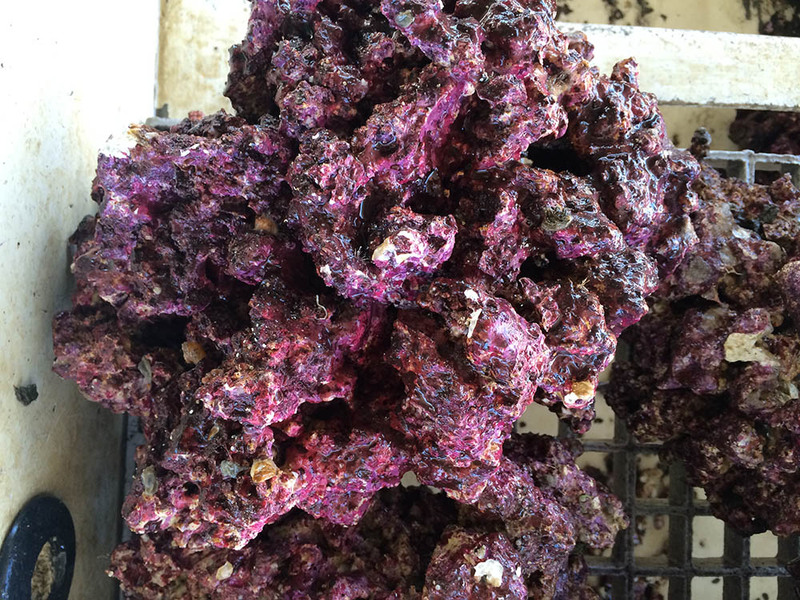 The coloring was never meant to last forever, just help the Aquarist have that established coralline look while waiting to grow his or her own. 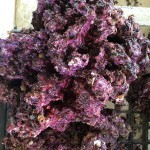 In time Real Reef will transform into a even better looking rock in your aquarium. Indeed, it would appear that in comparing the 2011 rock to the 2014 rock, even the coloration of the rock has been refined sgnificantly to give a more realistic appearance. 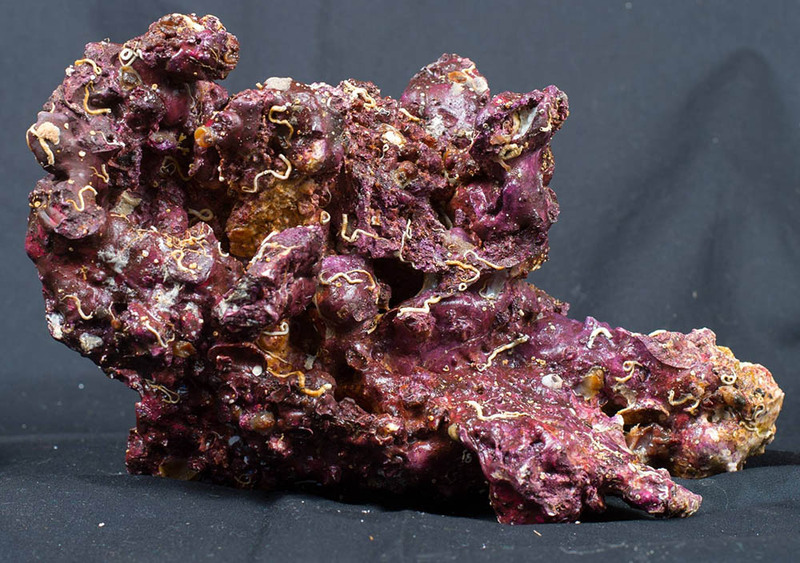 Most people familiar with the Real Reef product are already aware, but it bears mentioning that Real Reef offers this rock in two forms. 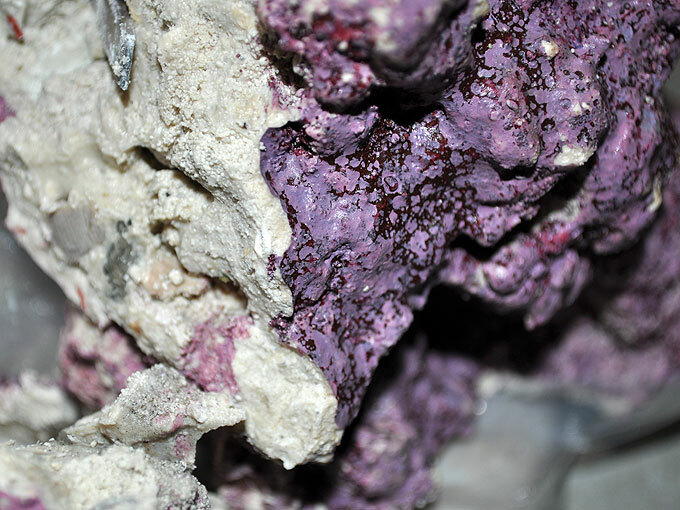 You can purchase Real Reef as a seeded live rock product, full of worms and other small invertebrate life and the beneficial bacteria you want, without the stuff that tends to die off and pollute in typical live rock (you also eliminate live rock as the source of pests). 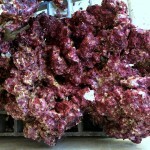 24-week cultivated Real Reef Live Rock – seeded with all the life you’d want, and none that you wouldn’t. However, one of the most interesting things to me is that you can also purchase Real Reef rock as a dry, unseeded product. Obviously you’ll lack the benefits of the seeded piece, but on the flipside you have a dry product with presumably very long term shelf life and reduced shipping costs, which ultimately result in a more economical option. 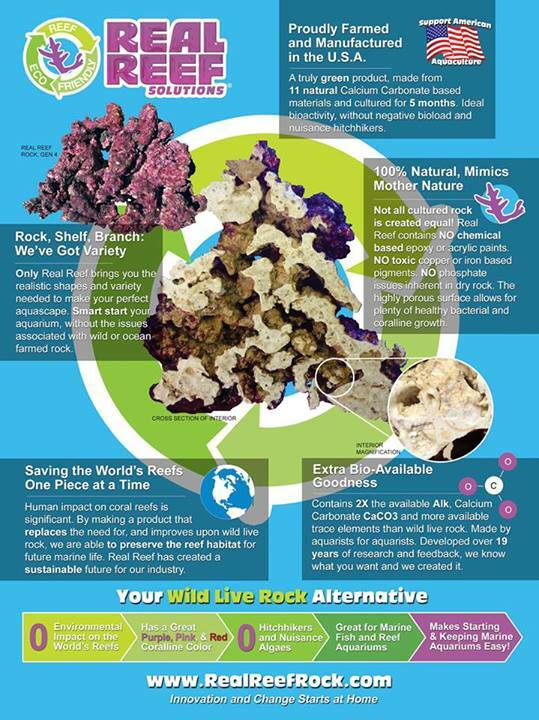 According to the 2014 MACNA Website, Real Reef will be in booth 523, where you’ll be able to get your hands on their rocks and see for yourself. We’ve included the latest Real Reef Advertisement below for some additional information. Disclosure: Real Reef is an advertiser in CORAL Magazine. This review was not a paid advertisement and is offered for informational purposes only.